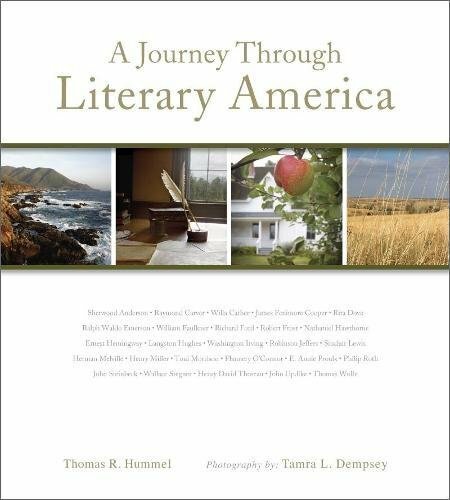 I bought this book–A Journey Through Literary America–as a gift to myself directly from the website, on sale and autographed. But it’s also available on Amazon. 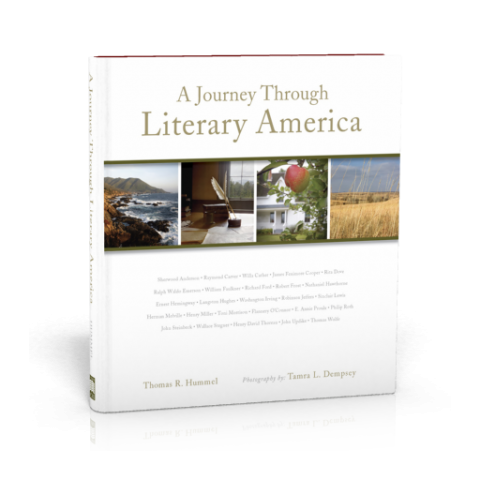 It’s “a literary pilgrimage in photography and prose.” Thomas Hummel (writer) and Tamra Dempsey (photographer) set out to find the stories and explore the places that inspired 26 of this country’s greatest authors. They begin in the Catskills with Washington Irving and James Fenimore Cooper, and the first words of that chapter are “In the beginning.” They travel west and back and end in New Jersey with Richard Ford, a sportswriter turned novelist whom I’d never heard of–but he went to Michigan State University, so there’s that. Along the way, they “visit” Ernest Hemingway near my hometown in Michigan. Those photos are, of course, especially beautiful. This book is a journey. Here are some first words. Blue-stem and bunch grass, red as sea marsh samphire. Of the free-breathing earth in golden sunshine. Using that strip of cloth as a measuring device, Willa’s aunt counted the number of revolutions of the wheel from the town until they felt thy must be in the middle of their claim. There was no other way. There were no landmarks to navigate by. When they finally made it from the town to their lot, the aunt and uncle settled down for the night–then a whipping prairie fire scorched their land. The fire may have done them in, with all their possessions, if it hadn’t been for the quick action of the driver of the wagon, who started a backfire. The next day, Nebraska’s newest settlers learned that the closest water was at their neighbors’ place, two miles away–and had been hauled there from Red Cloud, 16 miles distant. February 7, 1885 dawned bitter cold in Sauck Centre, Minnesota (population 2,800). Ice glittered on the town’s 30 lakes. The wagon ruts down the mud of Main Street were frozen as solid as the iron wheels that had made them. The Great Northern locomotive steam hung over the rails, too frigid to billow. On that day, a baby named Harry Sinclair Lewis was born. It had only been 24 years since the first white child was born in Sauk Centre, a former Indian territory. Harry Sinclair Lewis’s parents did not take his convulsive sobbing seriously. Infants find conditions to be unfamiliar and harsh, but they adjust, grow into little children, and naturally find their way in the world. Little did they know that young Harry would continue to find life to be such a trial, that he would eventually make them all famous–or how little they would like that fame. It was simple. Expressive. A calling card for a new poetic voice. It took Hughes about 15 minutes to write the poem that was anthologized dozens of times. “Poems are like rainbows,” he said. “They escape you quickly.” He was 18 years old. Who is your favorite American author? 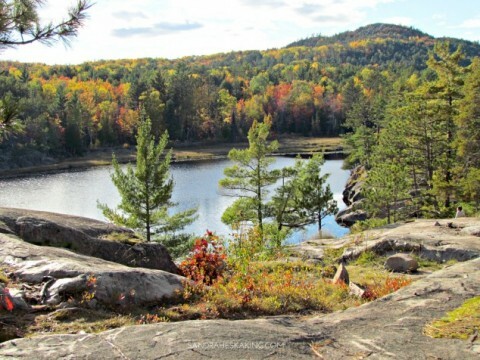 What is your favorite place in America? Are there any sentences here that make you sit up and take notice? How would you write the first words of your own story? Thanks for sharing, Sandra–I thought it such a coincidence to see this post when I just picked up “Literary Cincinnati,” by Dale Patrick Brown (not my original hometown, but where I’ve lived since getting married 46 years ago :-). Now I’ve got two “Literary” books to read!